Data from 2017 has revealed that Miami-Dade and Broward are two of the most dangerous counties to be a pedestrian. This will come as no surprise to anyone who has ever walked or cycled in Dade or Broward, however it highlights the need for improvement. 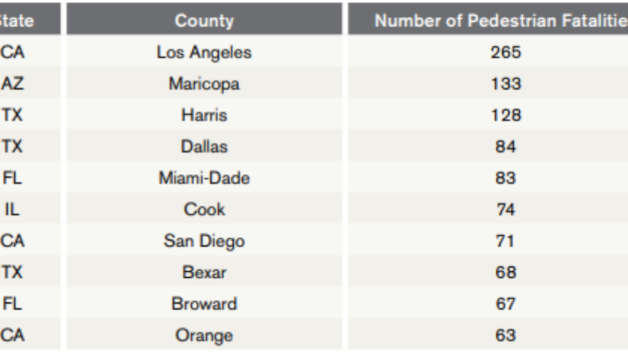 As shown in the table below, Miami-Dade is 5th worst in terms of the highest pedestrian fatalities in 2017, while Broward is not far behind in 9th place. This comes on top of a previous report by the Florida Department of Transportation which highlighted that Florida, despite being just one of 50 states, accounted for 20% of the nation’s cycling fatalities. Where do most accidents occur? The only benefit of such reports is that they provide information which can be used to reduce further accidents. For example, the report shows that a fewer number of fatalities happen when they occur on bicycle lanes. This suggests that increasing the number of bicycle lanes would decrease the number of fatalities. Similarly, the severity of accidents was lower when the cyclists were wearing protecting helmets. This has obvious suggestions for highway safety education and enforcement. However, the majority of accidents are still caused by drivers, so clearly pedestrians are not the main culprit here. I am a pedestrian and was involved in an accident – what should I do? If you or someone else has been injured, then the first thin you should do is to seek medical treatment. If the injury is life threatening, then you should call 911 or proceed to your nearest Emergency Room. In order to ensure you receive all the legal rights to which you are entitled, we recommend that you contact a bicycle accident lawyer.